It’s the dead of Winter here in Chicago. As I write this, it’s 3* and the wind chill is well south of 0*. If ever there was a time for comfort food, this would be it. Most often, that would mean a stew or soup or a baked casserole of some sort — lasagna comes to mind. This time around, however, I’m going in a different direction altogether. I need me some Summertime and its name is Pesto Trapanese. I first saw Lidia Bastianich, of Lidia’s Italy fame, prepare pesto Trapanese and it has since become a Summer staple of my diet. Like so many of her recipes, a few simple, fresh ingredients are combined to create authentic Italian fare. This dish, in particular, has many of the same ingredients of a fine marinara, with one critical difference. It is a pesto and, therefore, not cooked. The result is a pasta dish that screams “Summer!” Literally prepared in minutes, the flavors are fresh, like you just picked the basil and cherry tomatoes moments before — and come August, that is exactly what I do. So, when Winter’s winds howl and “Snow” is mentioned in just about every weather forecast, I turn to pesto Trapanese for my escape and it’s Summer in the City — well, for one meal, anyway. Toast almonds over medium heat in frying pan atop stove, 2 – 4 minutes. Add almonds, cherry tomatoes, basil, garlic, salt, red pepper flakes, & pepperoncini into food processor or blender and run for about 1 minute. 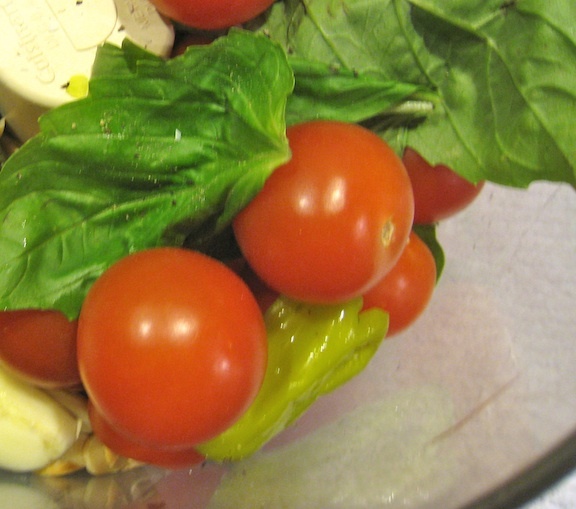 Remove spout and gradually add olive oil until fully incorporated. Mix with cooked pasta. Add some/all of reserved pasta water if pesto is too thick. Add grated cheese, mix well, and serve immediately. Pesto may be made in advance and reserved for a couple of hours at room temperature, before being added to freshly cooked pasta. If its use is delayed longer than that, it should be refrigerated and may be kept up to 2 days. 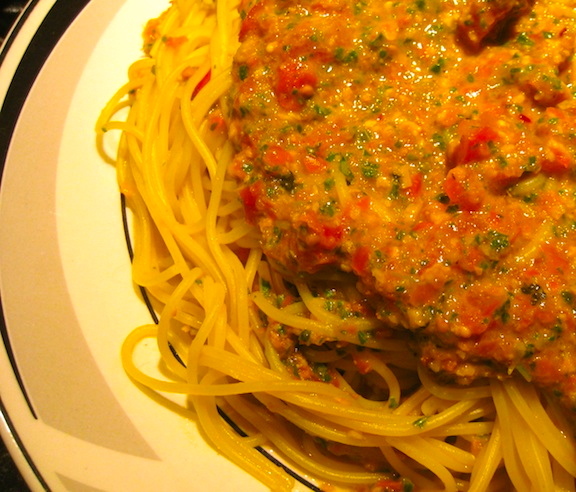 This entry was posted in Pasta/Rice/Soups (Primi Piatti), Sauce/Gravy (Ragù/Sugo), Vegetarian and tagged Basil, Food, Italian, Pasta, Recipes by ChgoJohn. Bookmark the permalink. Another recipe to add to my must try very soon list John. Thank you, and it does scream summer ! I hope you enjoy it, Claire. It’s so quick and easy to prepare and you can’t beat that fresh taste. Thank you very much, Judy, and you’re not alone as far as sighting icicles. Last year we saw very few and haven’t seen any icicles at all yet this year. We are now in record setting territory for going this deep into December without a snowfall. Seems so weird. I love this pesto. The cherry tomatoes give it such a fresh taste. It’s a real treat for me during the Winter. It’s so reminiscent of Summer.